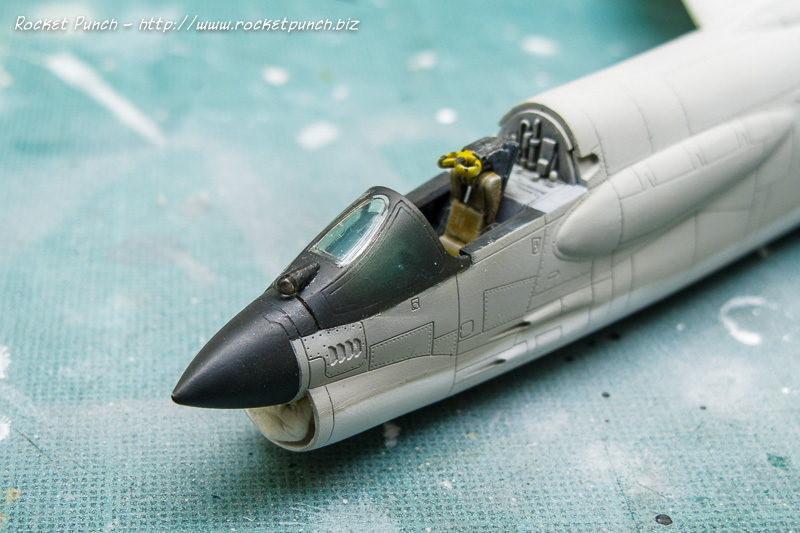 I spent some time fiddling with the canopy to get it to fit flush with the fuselage but it seems like the tolerance is very tight and the Future coat actually made the canopy thicker. I ended up resorting to some sanding and leaving out the back section of the canopy. And then it was time for the decals. 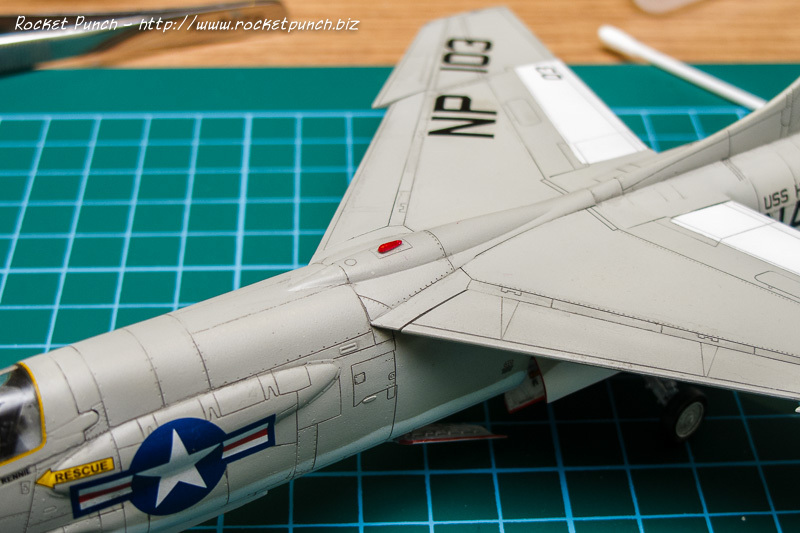 I decided to use the F-8E Crusader markings from the Wolfpak Decals 72-039 ‘Down the Rabbit Hole’ sheet. These were the markings worn by an F-8E from VF-211 ‘Fighting Checkmates’ which claimed the first air-to-air victory by this aircraft. Ironically it achieved this with a missile and not with its guns. The Wolfpak decals proved a bit resistant to Mark Softer and I had to use several passes before they really snuggled down the panel lines. Otherwise though, they are pretty easy to use. 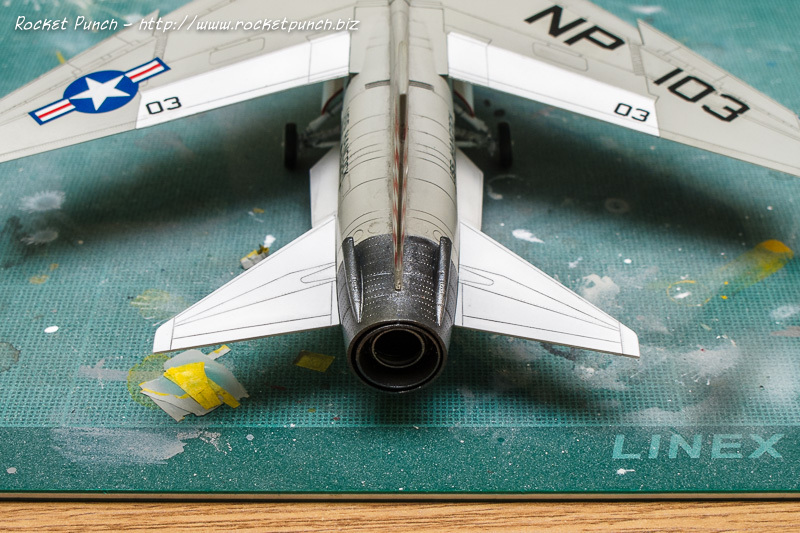 I think the blue on the stars and bars are too light but went ahead with it since I’m no expert and the kit provided ones are sized differently.Â the ‘NP 103’ markings on the starboard wing silvered but that is due to my less than smooth gloss coat. Chalk that one up to my usual challenge with Future. As for the stencils I decided to put on all the major ones and skipped all the ‘no steps’. 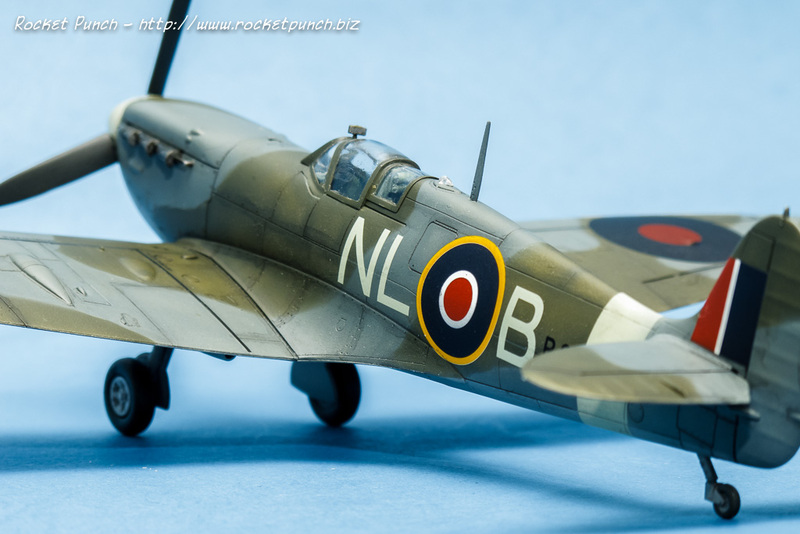 It makes for a cleaner looking plane and less of a headache on the modeler. 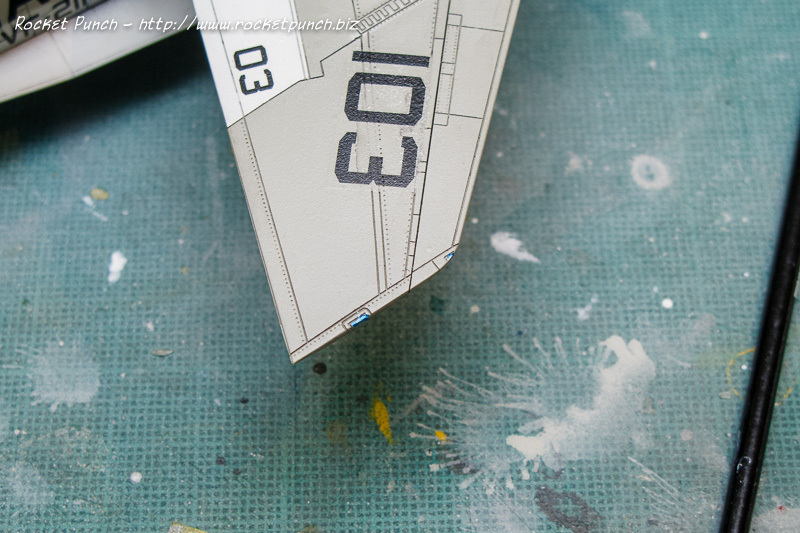 The stencils are from the kit and are designed by Crossdelta and printed by Cartograph. Very nicely done and easy to use. After a day of curing and wipedown with a wet cloth to remove decal residue, I then sprayed on another layer of Future over the decals. A minor disaster struck: the Future spattered and I ended up with some orange peel. 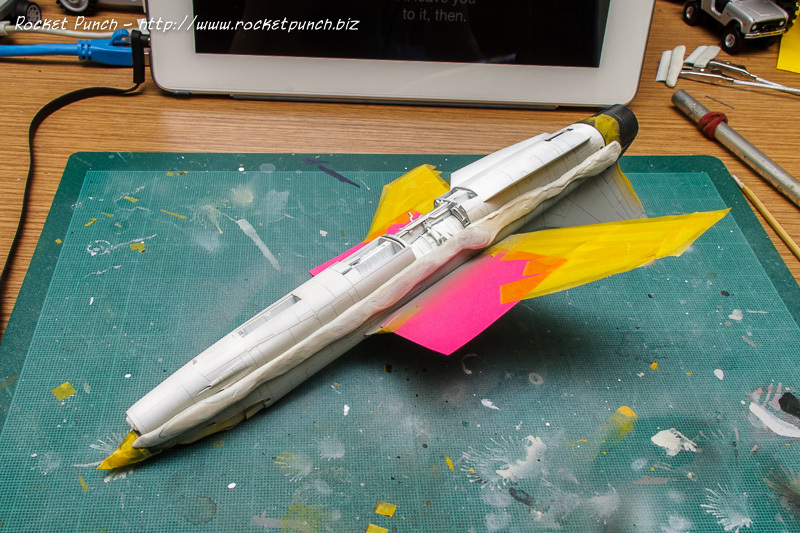 I fixed whatever I could with a Windex-soaked cotton bud and hope that the final finishing flat coat will hide it. 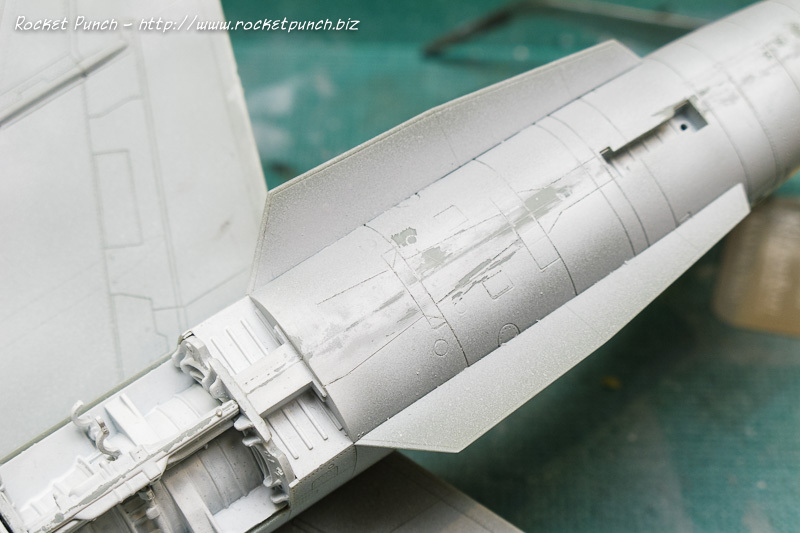 For the main fuselage panel lines, I tried to do pin washes but the Vallejo Wash didn’t travel down the panel lines as smoothly as I hoped. This was even though I have thinned the wash quite significantly. I probably need to add something else to break the surface tension. But that’s for a different project. So for this kit, I simply brushed roughly on all the panel lines. Leave to dry a bit, then wipe away with a Windex soaked tissue paper. I originally used water for wipe down but it’s not as effective, especially when the wash has dried. I had to be careful with the Windex though as it can dissolve Future. Anyway, maybe it’s time to consider something else for the gloss coat before panel lining. So panel lining is quickly over and done with. Next is putting everything together. First up are the landing gear. The gear doors took some finessing due to their small size but stayed put with some extra thin cement running down the joints. I managed to launch a part of the nose gear into the ether but found it on the floor a few hours later. Ding! Disaster #1 averted. 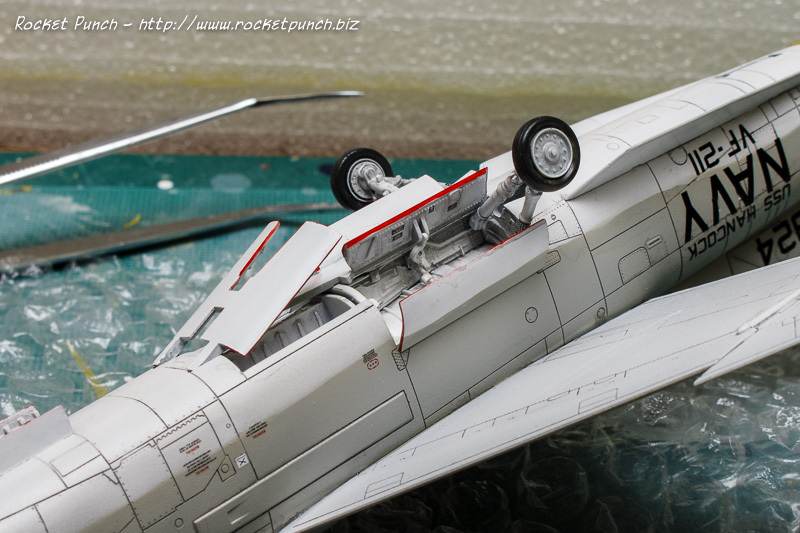 The main landing gear were attached with the help of both cement and super glue. 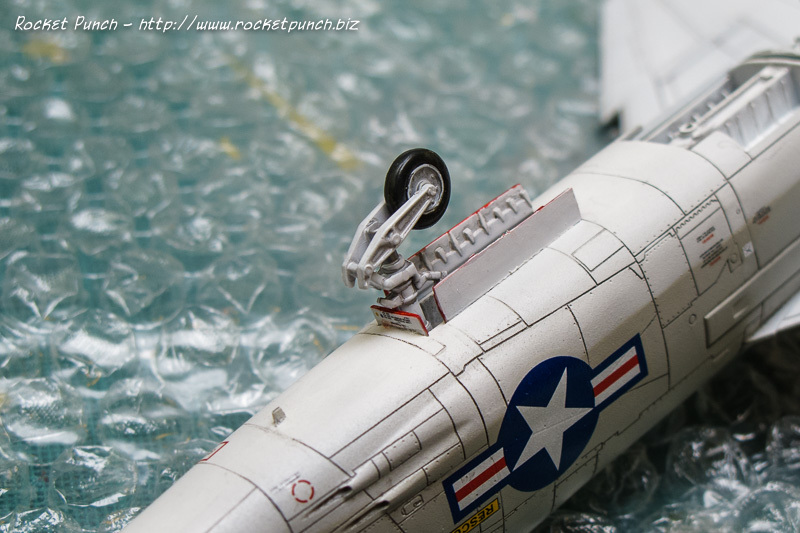 The dive brake looked like it would clear the bottom of the main landing gear but it turned out OK.
Then I attached the pitot tube with extra thin cement. 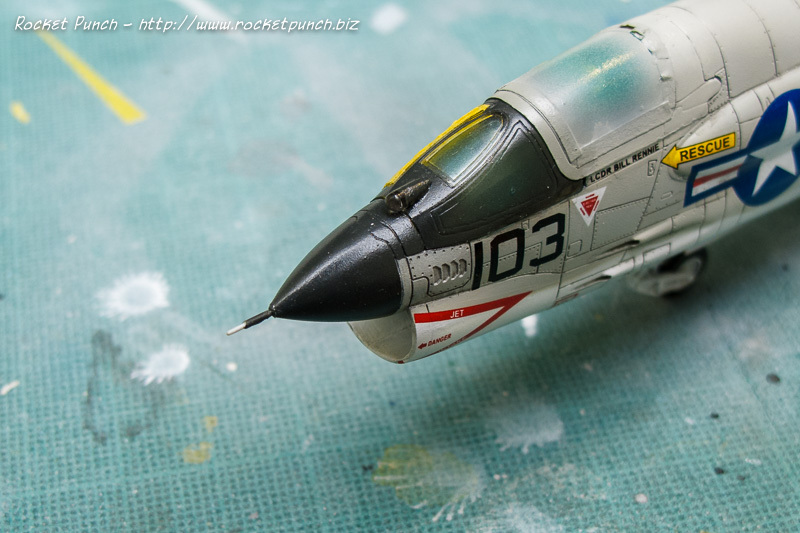 The front canopy is actually framed with yellow which Academy provides as decals. I’ll have to add them after my final coat. 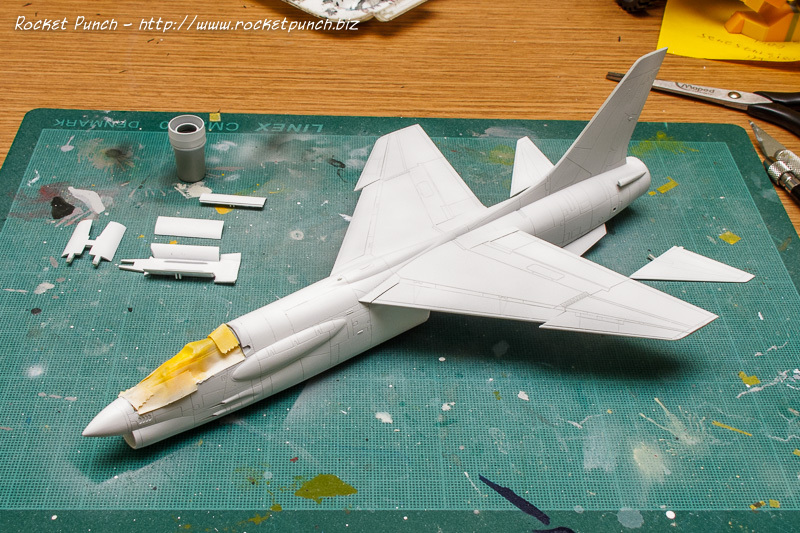 Next are the tiny clear parts on top and bottom of the fuselage. I attach these with PVA glue. The top part went on fine and was painted clear red but I managed to catapult the bottom clear part into the jungle that is my room. Ding! Official Disaster #1! 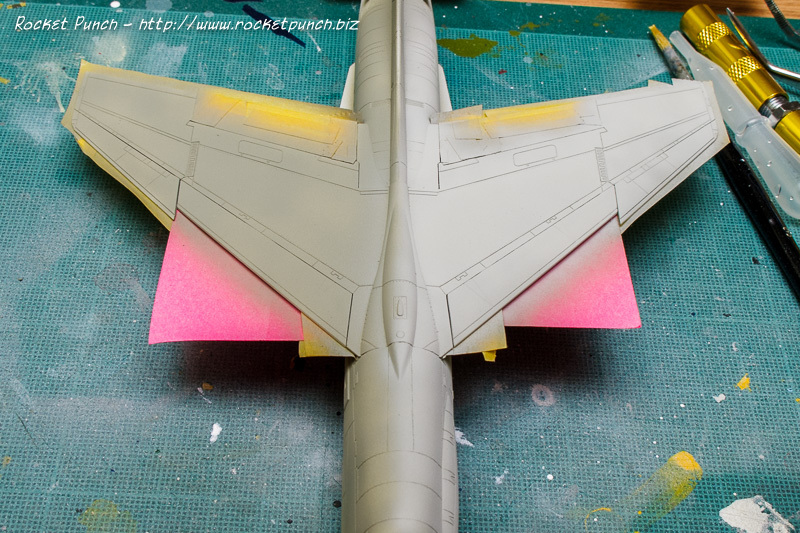 Thankfully, the wing lights didn’t come in separate clear parts so all I had to do is paint silver as a base then clear blue on the starboard wing and clear red on the port wing. 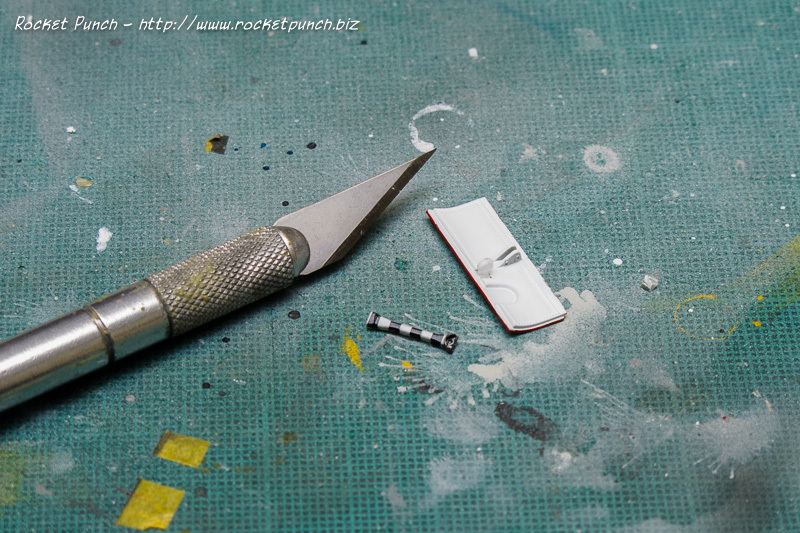 Much much easier than having to fiddle with the really small parts. 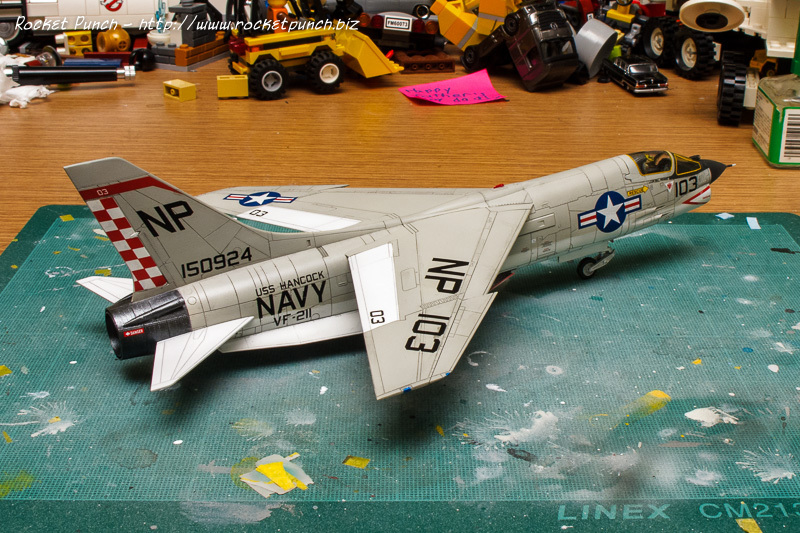 Note the problem with the decal on the wing there. Oh well. The paint on part of the port horizontal stab chipped off. No big deal there so I sand it down and respray the white color (which is actually just white primer). And… the colors don’t match. Much gnashing of teeth followed. Ding! Disaster #2! The solution I came up with is simple: I cheat. I masked and sprayed white primer on the whole panel on both stabs. And since they are at the bottom, it’s easy enough to get away with. They were then very carefully pushed into the fuselage. The fit was very tight so I didn’t use cement. There is a slight dihedral of the stabs but otherwise, both are exactly the same. I also added the engine into the exhaust which also fit without need for cement. 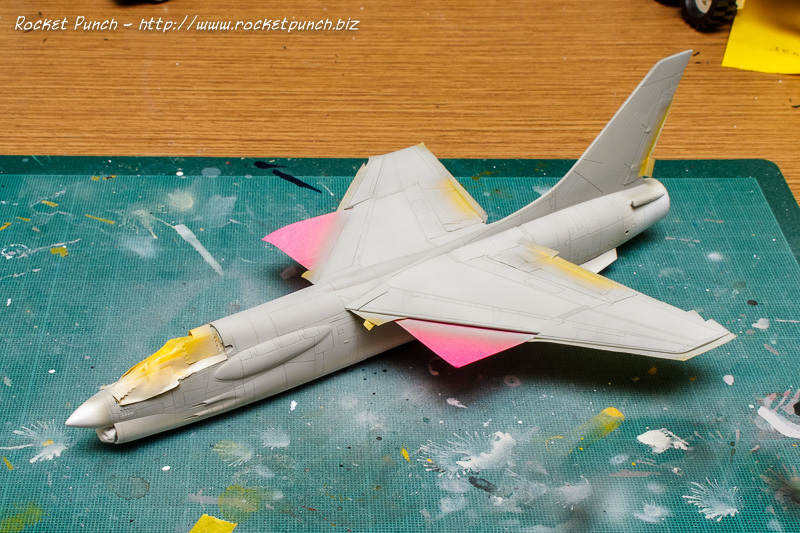 Hi-viz aircraft were apparently glossy in real-life so I went with a satin coat for the final clear layer. 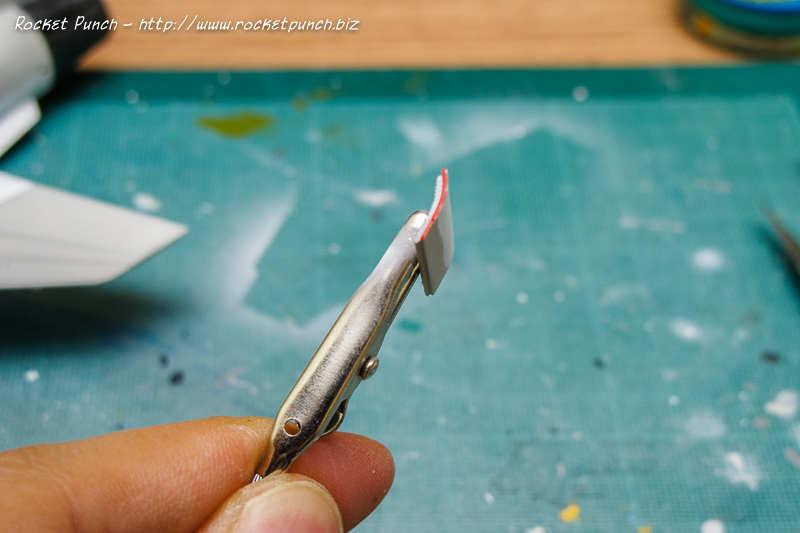 This time, I tried out Vallejo Polyurethane Satin Varnish. Even thinned 50% with water it refuses to be sprayed by my 0.3mm airbrush. 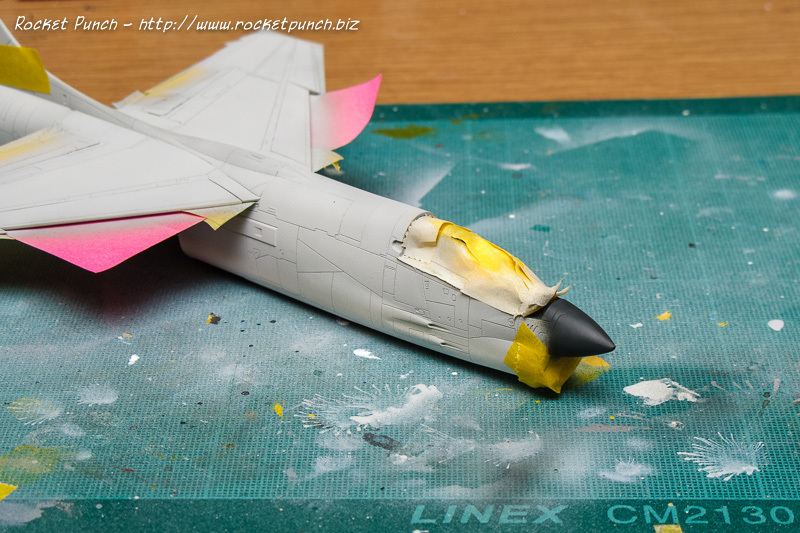 I ended up using the 0.5mm airbrush and it went on very smoothly and easily. Once that has cured I removed the masking on the canopy (not perfect but not disaster worthy) and finally add the canopy frame decals. 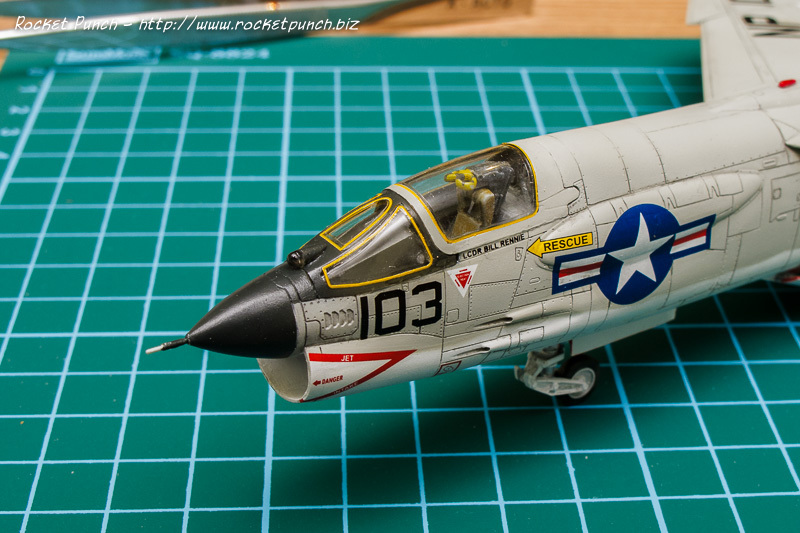 The main canopy frame is made up of 4 separate decals. While very small, they went on without much problems. The IRST ball and the lights were then given a brush of Future to shine them back up. I decided to give Lifecolor UA035 Flat Light Gull Gray a go and it turned out to be a more ‘correct’ shade of FS36440. Layering over the previous warmer shade of gray probably changed the color somewhat but it’s OK as long it looks more ‘right’ to my eyeball 1.0. 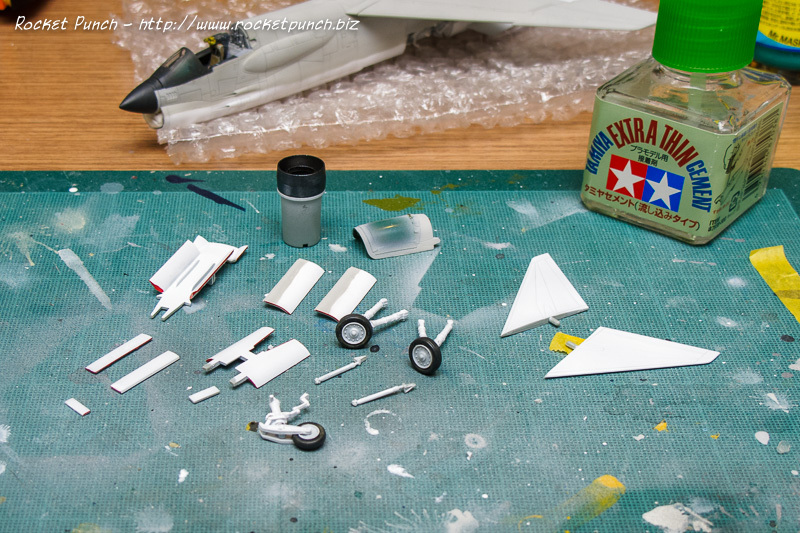 Since the Crusader marking I’m doing requires a black nose, I masked and sprayed Vallejo Air Black Grey at this time. 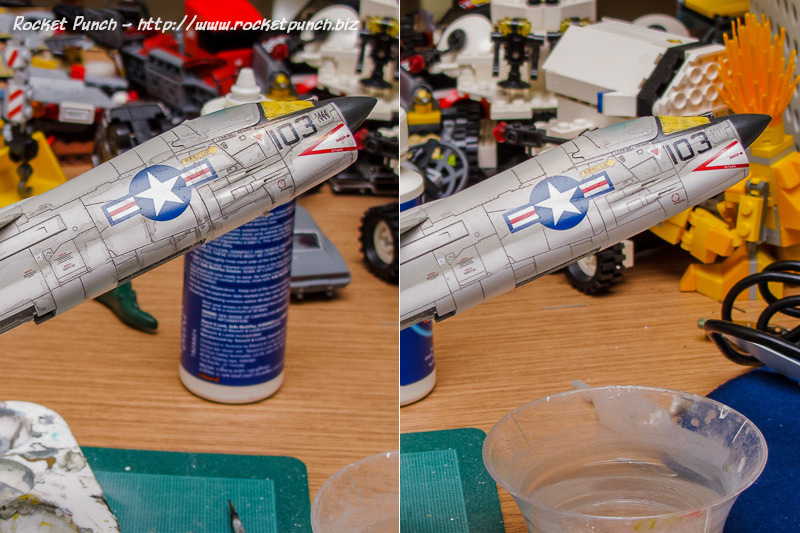 I then used the remaining paint on the exhaust. I’ve noticed that the Vallejo metallic colors look better on top of a dark base color. The exhaust was sprayed with 073 Black Metal. 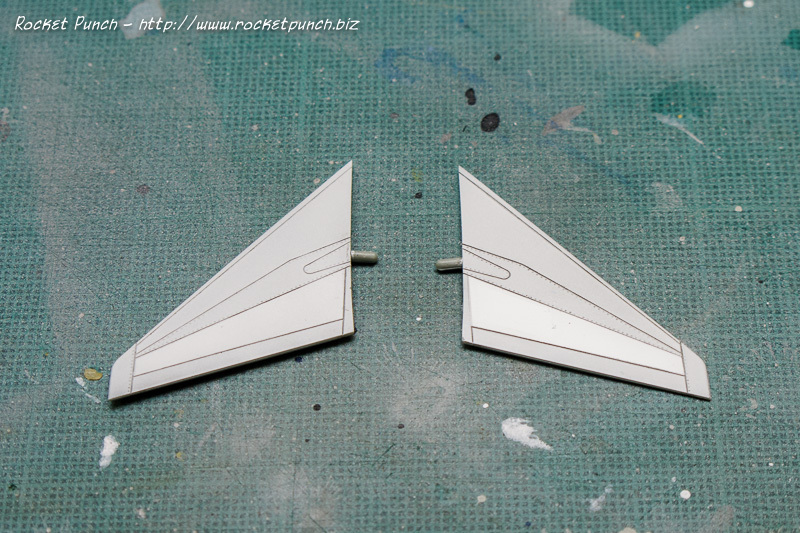 If I ever do this kit again, I’ll leave off the air scoops until final assembly. It’s quite hard to mask around. 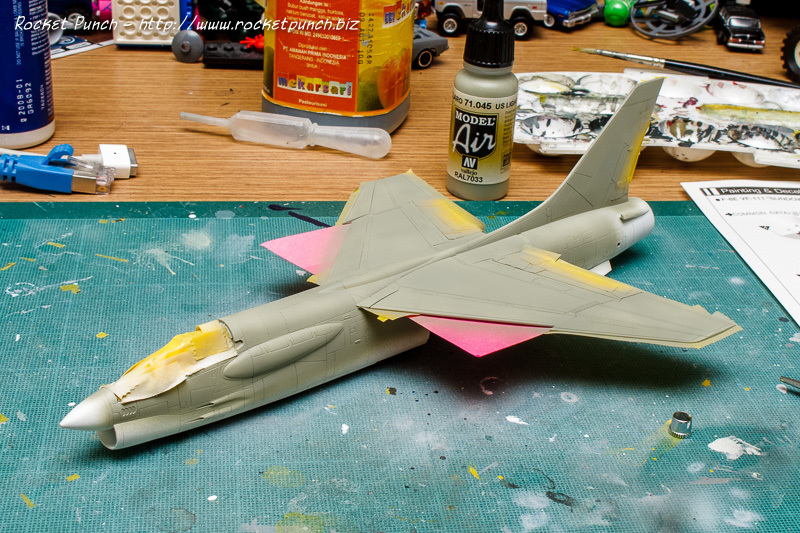 Next up is finetuning the camouflage and fixing overspray. The demarcation for camouflage is not a solid line but it’s not as soft as what I did freehand. So it’s out with my blutack again. I made sure to spray at a 45 degree angle so the demarcation is more solid. However, a close-up look will show the line is not totally solid. 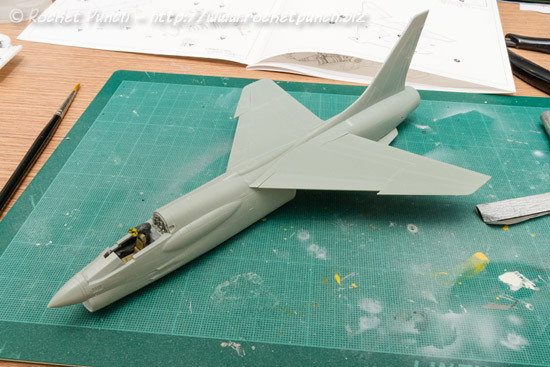 I think it should be OK for 1/72 scale. I’ve also read that the camouflage is touched up by hand with spray can while out at sea so the demarcation not being straight and neat is correct. Then it’s time for all the small items. Typical of modern subjects, there are quite a few of them. 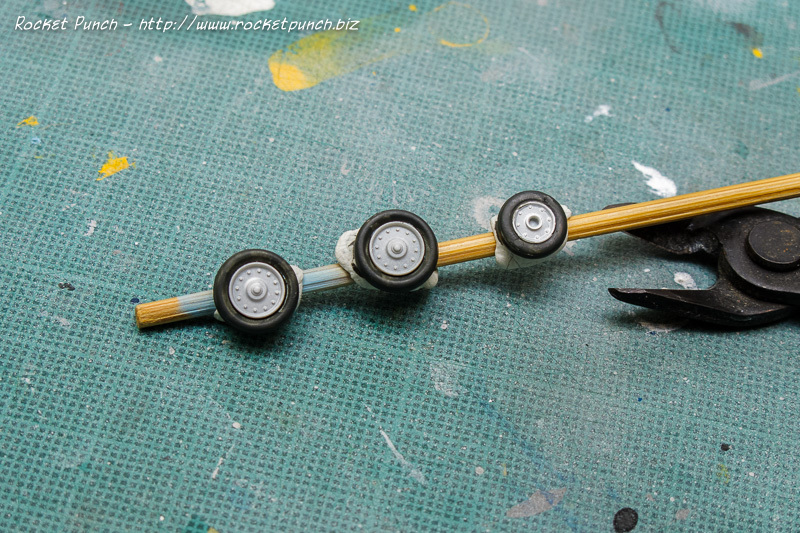 The wheel hubs were sprayed white and the tires are (very carefully) handpainted in black grey. The edges of the gear doors and air brake are red in Navy aircraft. I colored them with a permanent red marker. The IRST ball on the windshield is added at this time. I had to cut off the male peg though for it to fit properly. Did I mention it’s REALLY tiny? Lastly the a tiny light is attached to the starboard MLG door and the housing quickly handpainted white. The arrestor hook barber pole pattern is a decal which thankfully snuggled down with a healthy dose of Mark Softer. It was then glued into the housing. After another round of fixing the seams and rescribing, I called it done and did a final primer coat to prep for painting. 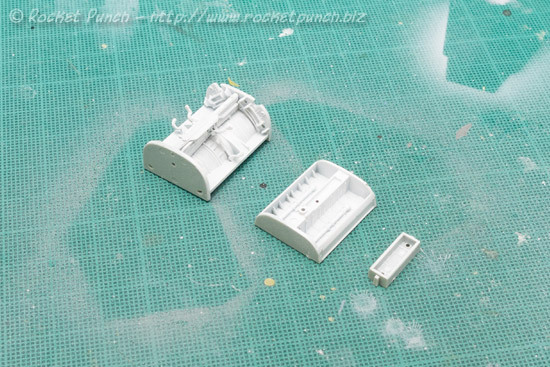 For this kit I used Vallejo White Primer instead of the usual Tamiya rattle can primer. It required multiple thin coats but at least it doesn’t smell as bad. As is the norm in the 1960s, the Crusader’s camouflage is made up of a glossy light grey up top and white on the bottom. I decided to use the primer as the white color of the camouflage so I masked off the moving surfaces on top which needed to remain white. 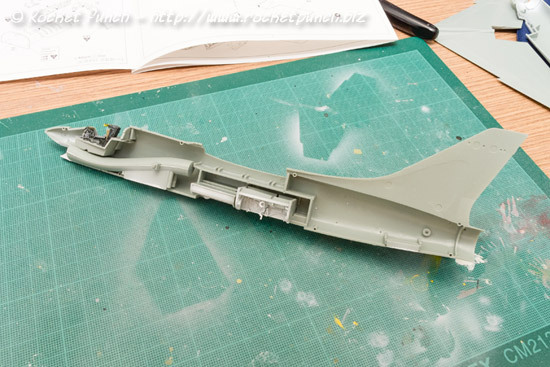 The gray is FS16440 Light Gull Grey which I matched to Vallejo Model Air US Light Grey 045. This color is matched to FS36440, a matt version of FS16440. 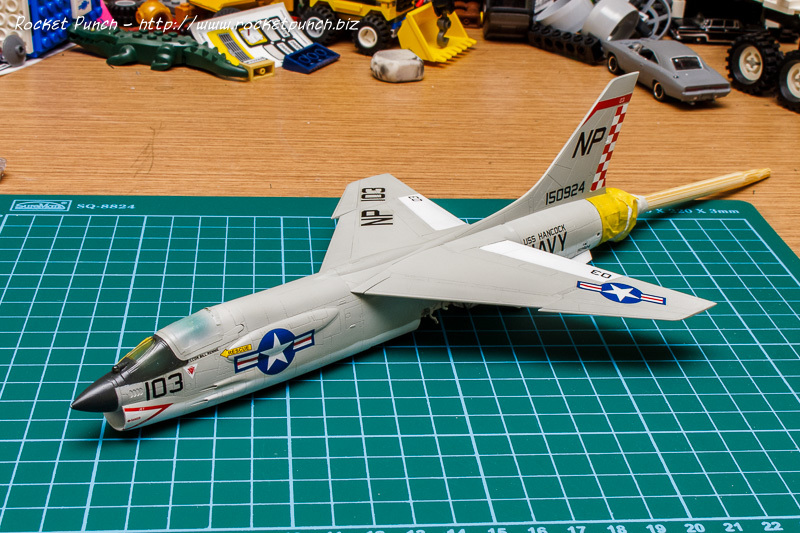 After spraying it on though, I find that the color seems overly warm compared to what I’ve seen of the F-8E online (here, here, here and here). I’m not sure if this is a trick of the lighting even though my photo is taken with a daylight balanced flash. Also interesting to note is that even on the 4 sample photos of the real aircraft, the grey all look to be of different shades. The only thing common about them is they are cooler (blue) than what I have. Work continues on this kit with fixing seamlines. 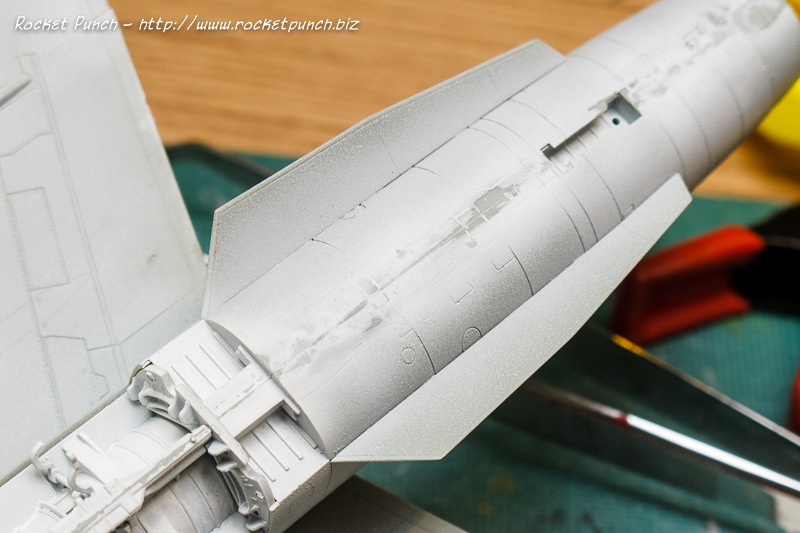 This kit has a lot of panel lines and rivets that get obliterated due to sanding. I rescribed with a needle + pin vise combo using a strip of dymo tape as a guide. I choose to not redo the rivets just because :). It was also here that I realized I have flipped the ventral fins. They are the same except the side with more details should be facing down. Oh well. Next up I masked the canopy (which went for a dunk in Future previously) with Tamiya tape and Gunze Masking Sol. 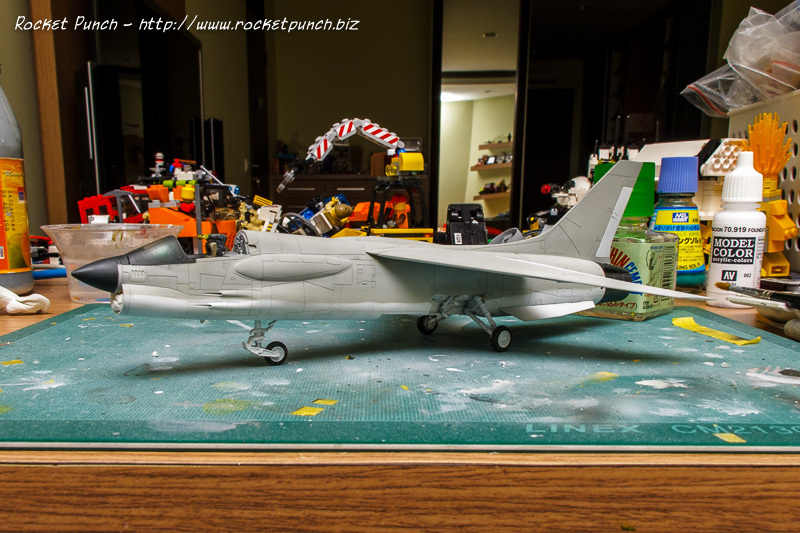 The front canopy had curves that was hard to mask with tape so I brush painted the masking sol free hand. There is an IRST ball that needs to be attached on the front canopy but I think I’ll hold till later. I’m also holding off attaching the canopy till after all primer is done on the main body. In this pic, there is a bit of gray peeking under the main color of the canopy frame. That’s the primer layer. It’s not very nice looking so I’m trying something different this time to prevent this from happening again. Now it’s time to put the two halves of the fuselage together. First up, the myriad parts I needed to assemble before hand. Incidentally, all were sprayed white. 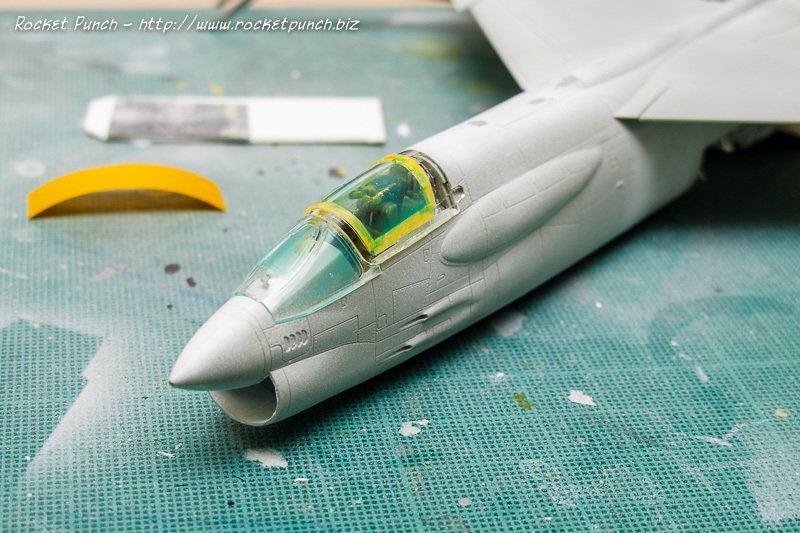 Academy provides a long trunking so you can see into the nose intake. Nice. From left to right: the MLG bay, the belly flap bay and the arresting hook bay. All are decently detailed for their scale. 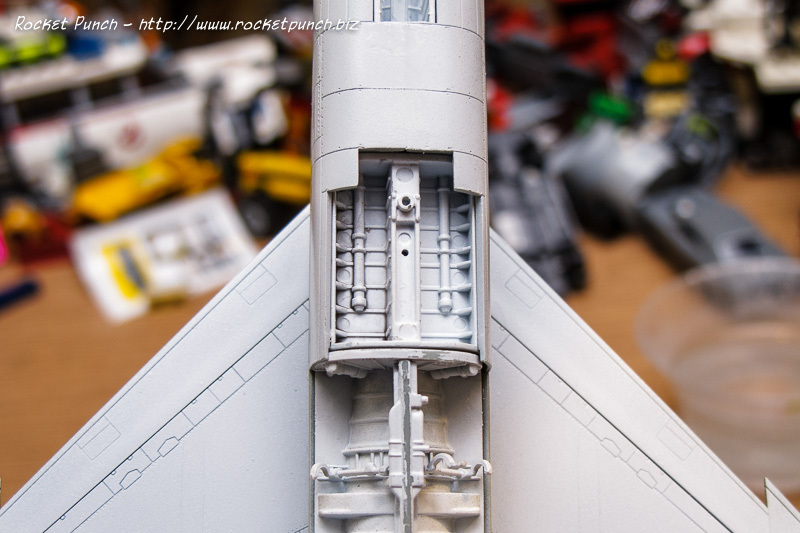 I decided to cement them onto one side of the fuselage before putting everything together. It took a bit of adjusting and finesse but the two halves fit pretty much perfectly with no noticeable gaps. 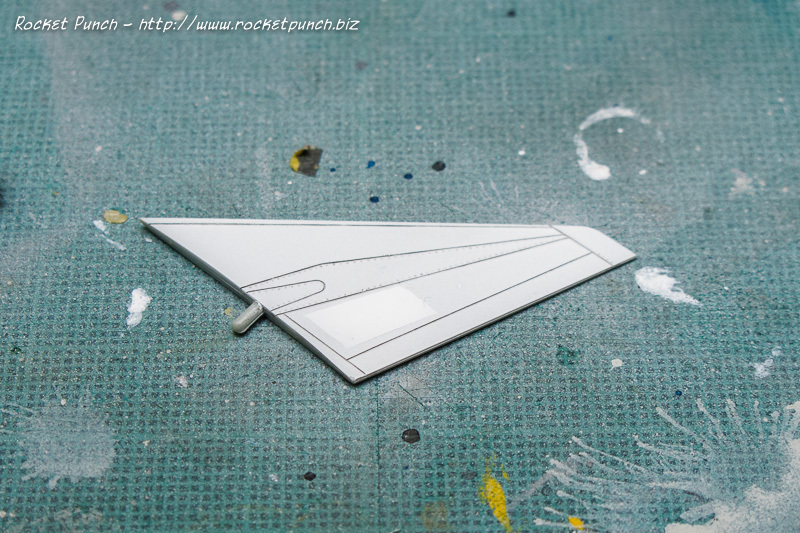 I had to sand down the fuselage so the wing can fit flush. 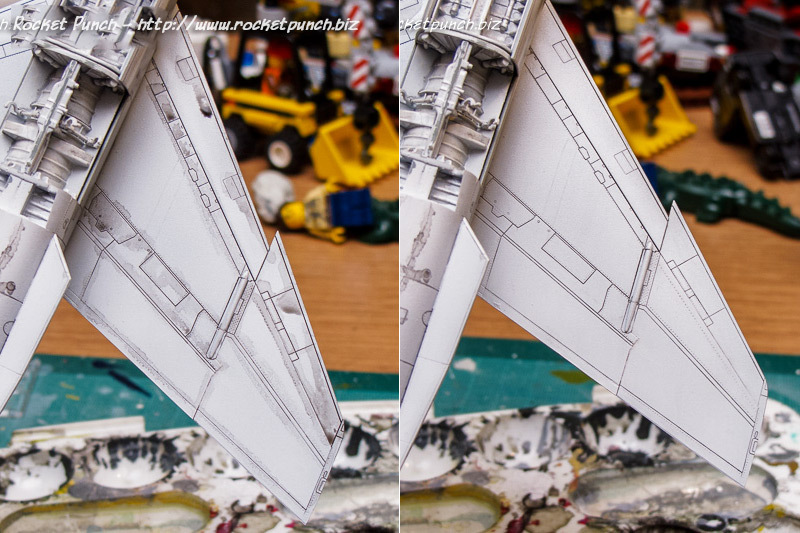 Not an issue if one plans to install the wing pivoted.